We lost our sweet cat Boots today. 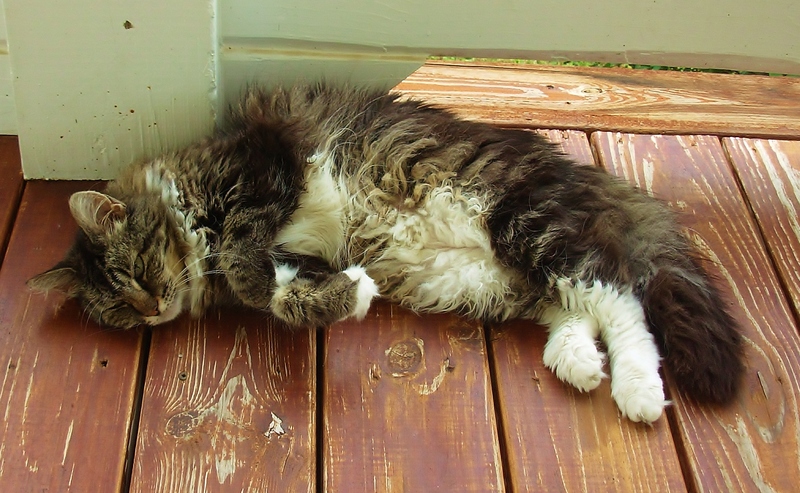 She was 17 and her health had been failing for a few months. She seemed to be in no pain and we just tried to make her last days comfortable and peaceful. We will miss her so much but she had a long happy life and she gave us lots of joy. 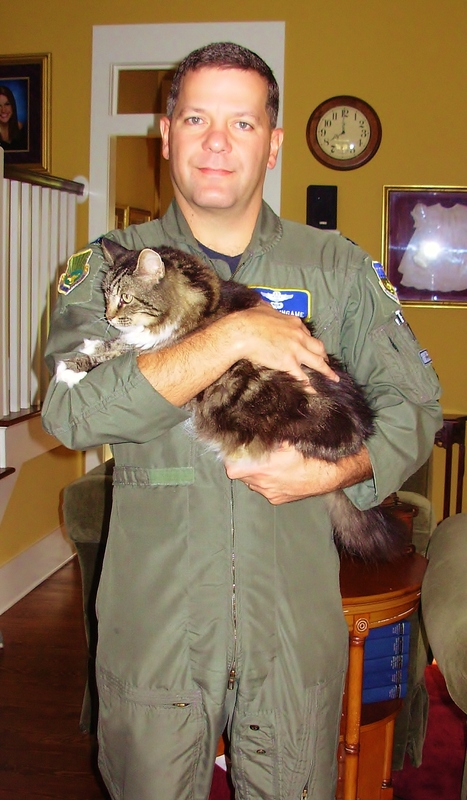 Boots was found in April 1995 along with another abandoned kitten on Reese AFB in Lubbock, TX. 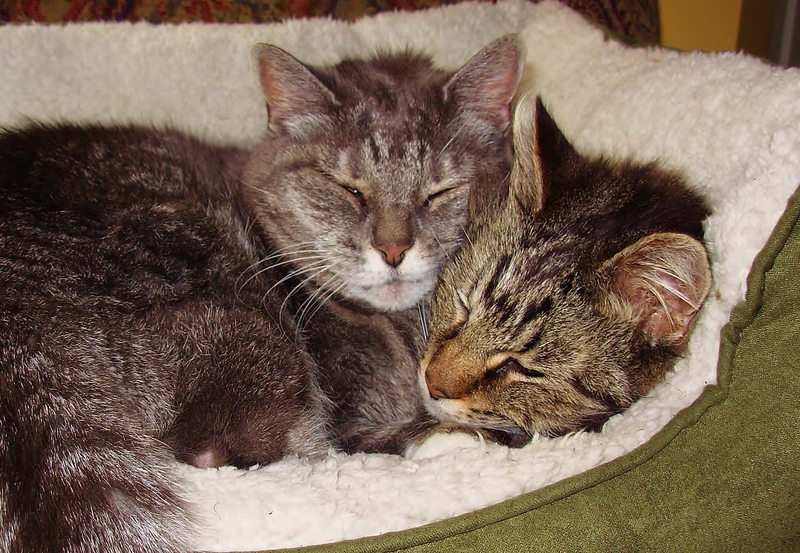 We’re not sure if Missy and Boots were actually sisters, but they were the same age and found in the same vicinity. 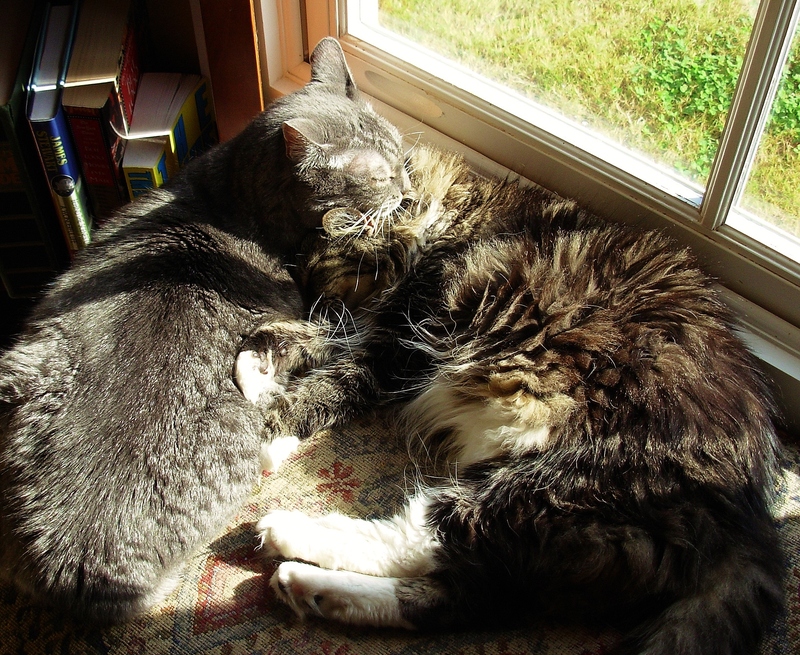 Our daughter, Hannah was six years old at the time, so she and Boots grew up together. 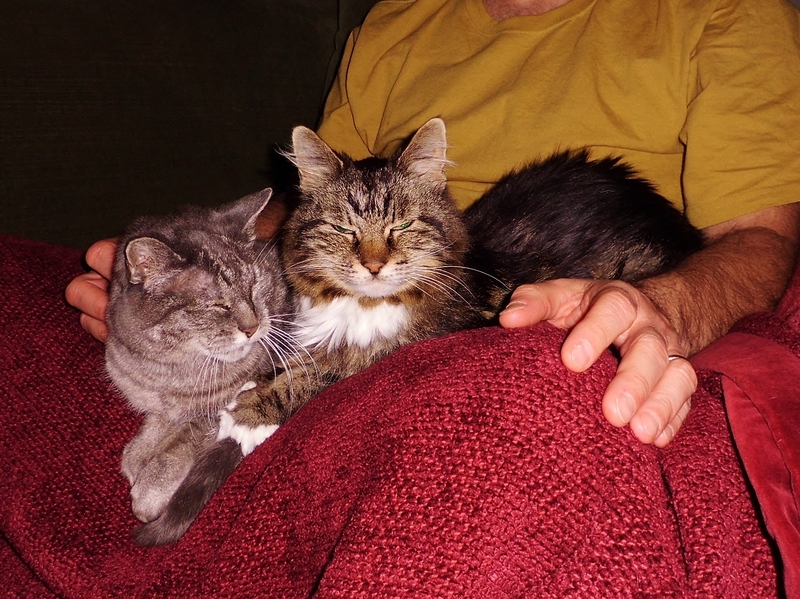 Boot’s favorite person was always Hannah but when she left home, Jim became her best buddy. This was taken on his last day in the Air Force. He wouldn’t let me take the picture until he’d picked her up. 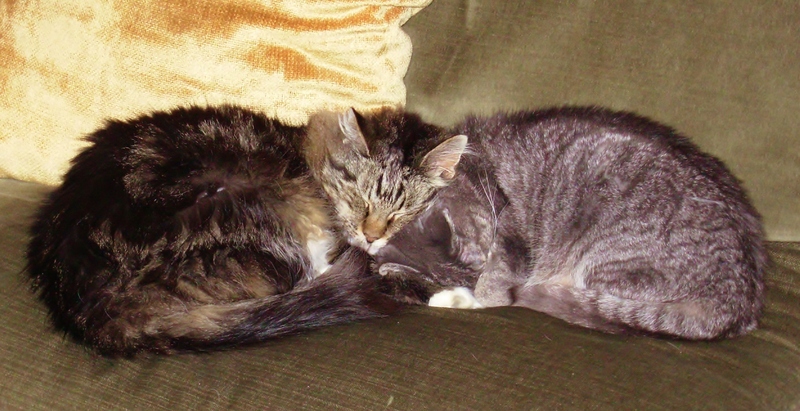 She really loved sleeping on him and for the last few years she became very lovey, dovey. 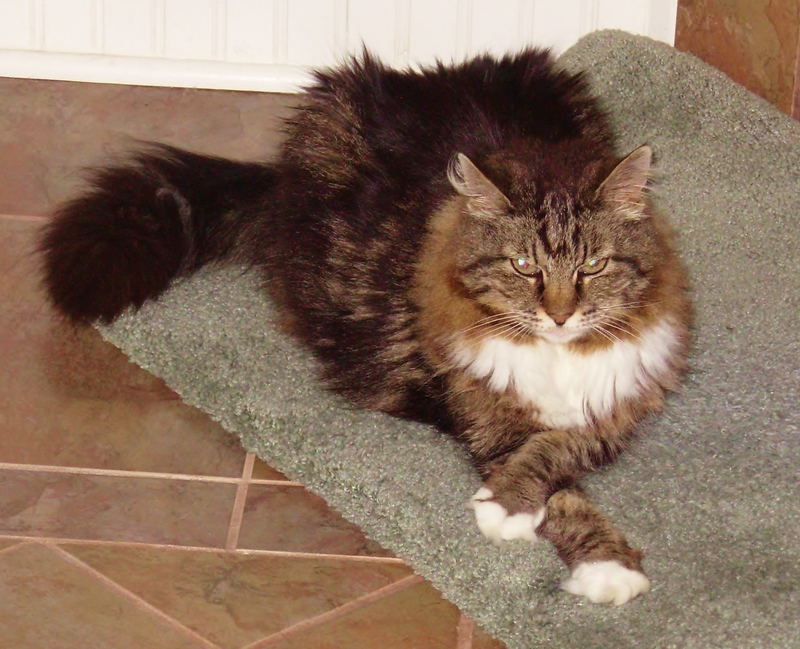 When Boots was younger, she was a slightly plump, very fluffy girl with luxurious fur. 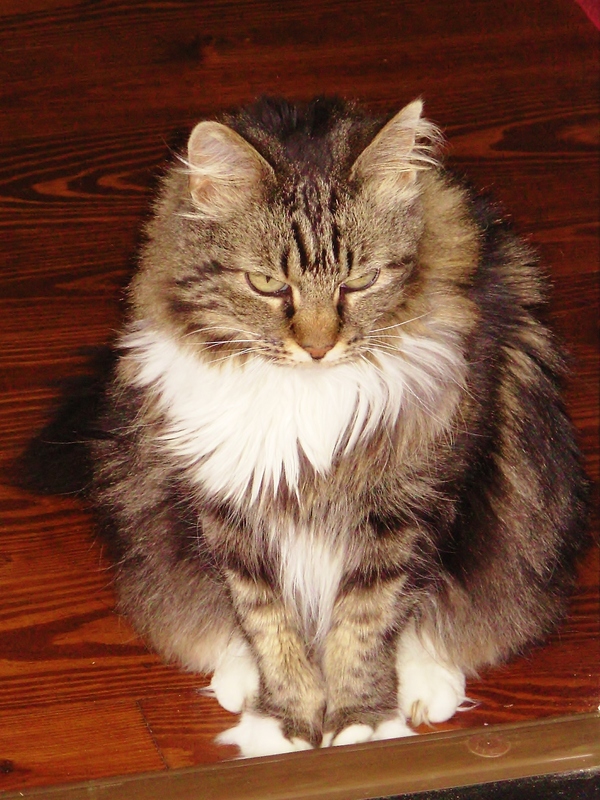 She had a very cute and prissy way of crossing her paws when she sat. 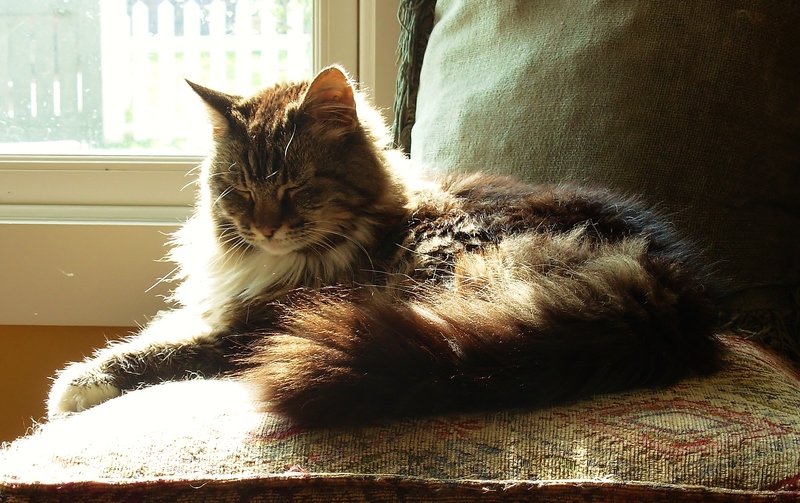 In later years she got thin and her fur was not as fluffy, but we still thought she was beautiful. 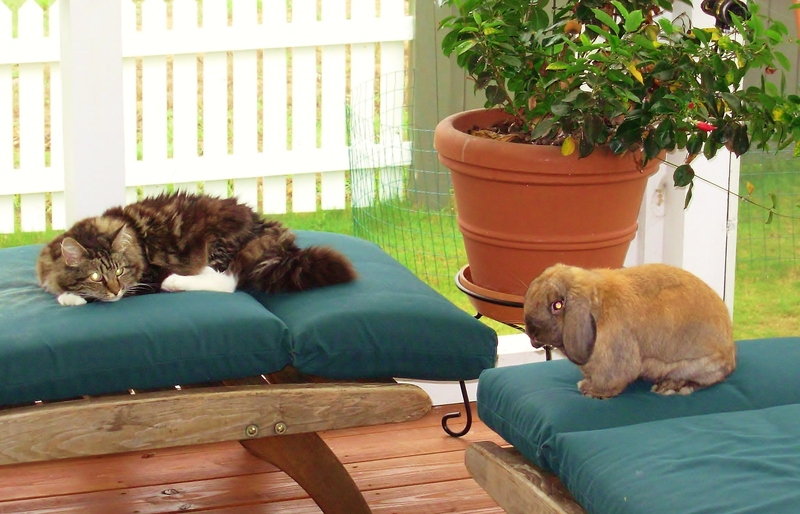 Boots had an unusual personality for a cat. 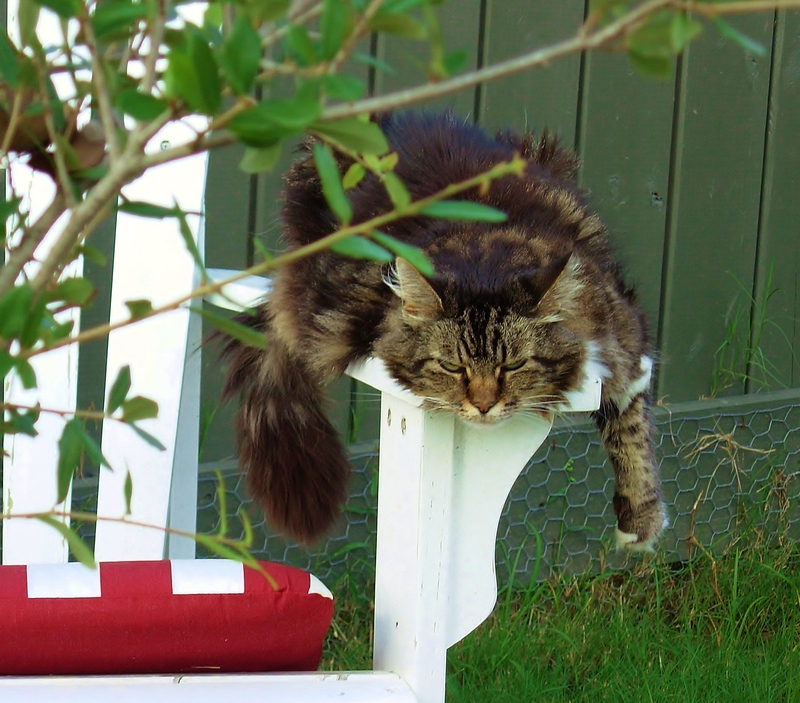 Instead of being temperamental and high-strung, she was very laid back, friendly and sweet. She put up with a lot in her long life and she always seemed to be happy. Now I’ve really seen it all. 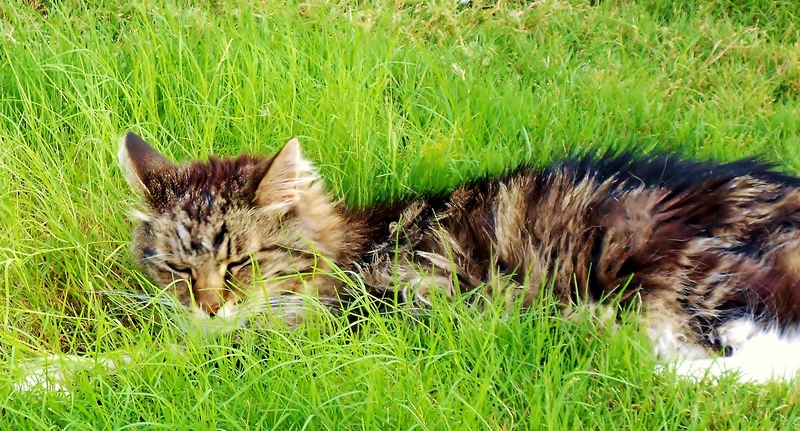 Boots really loved being outdoors and she spent much time in our yard enjoying sunshine and grass. 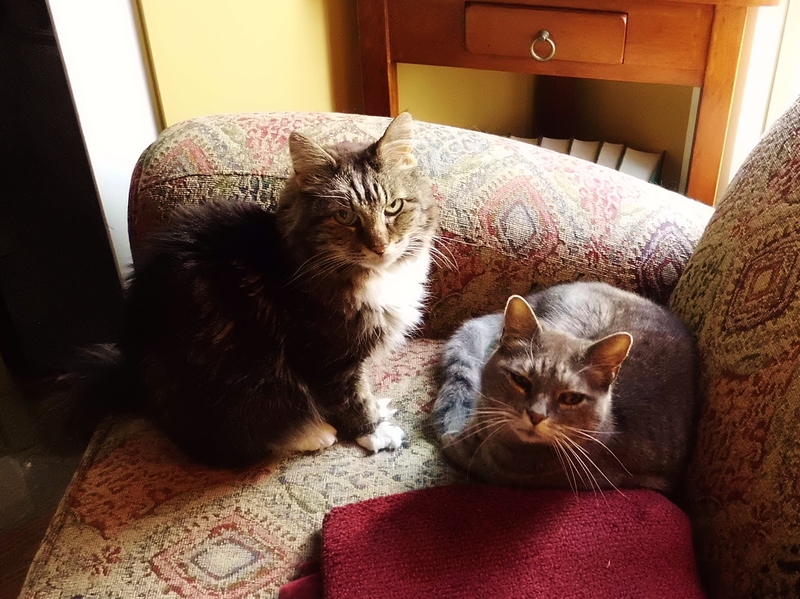 Boots also had a bit of arthritis in her old age and she felt most comfortable near the fireplace in winter or in a sunny window curled up with her sister. 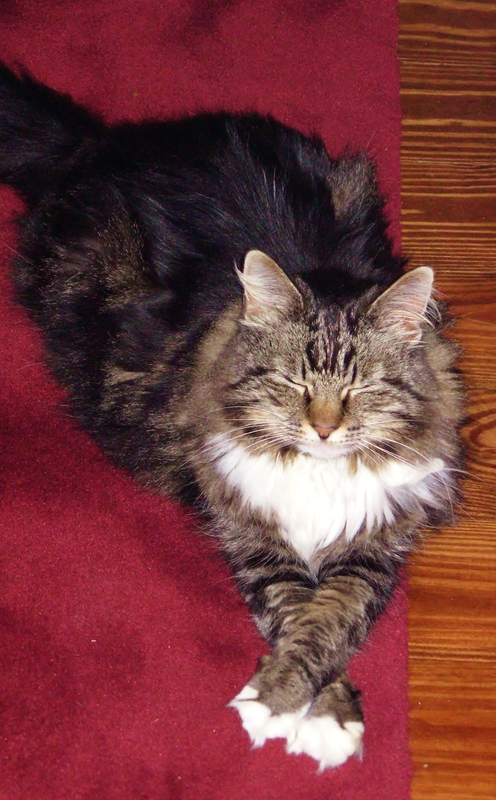 Missy is still with us and in reasonably good health. I know she will miss her best friend and we’ll try to make up for her loneliness by giving her extra love and attention. 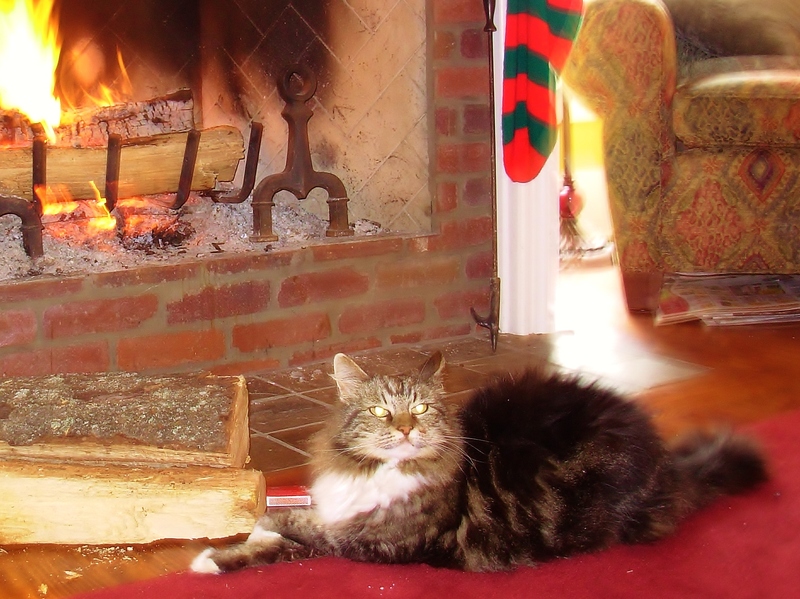 Boots had strayed from the porch yesterday and did not come home last night. We looked everywhere for her and were very worried. This morning I went for a walk around the neighborhood to try to find her and had just said a short prayer asking that I could at least find her body if she were dead. At that very moment I saw my friend Jonathan carrying her from the pool. He kindly brought her home for me to bury and now she is in our small pet cemetery with Bitsy and Boo Boo. I don’t know why she had walked so far from home. Animals have mysterious ways and I am just so grateful to be able to say goodbye. 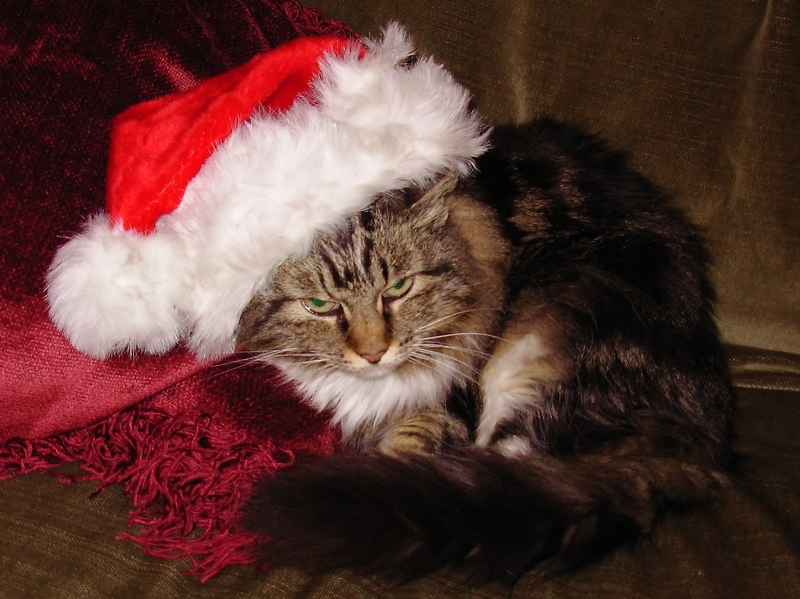 Were very sad, but pain comes with joy and she gave us 17 years of that. Goodbye my dear old girl. You were dearly loved. Thanks Regan. I needed that. So Sorry!!! 😦 But that was a beautiful tribute to her and joy she brought to you, Jim & Hannah. Ditto on the hugs. Thanks Renee. Can’t have too many. Oh Debbie! What a lovely tribute to a wonderful family member! So sorry for your loss! I talked to her Saturday. I know you and Jim are sad and lonely for her. Thank you Marcie. I’m glad you got to see her one more time. Just sent you an email. I really had no idea she was about to cross over the rainbow. What a nice way to say it Marcie. Thank you. I just can’t take it anymore. In tears again. So sorry Debbie. You’ve had a rough month too. Hugs to you.